- Dated ticket, valid once on the chosen date. - Order at least one day in advance. Visit the park during the week (until 19/04) and buy your tickets online with a €4 discount ! - Rate for 4 people. - Minimum 1 child between 1m - 1m40. - *based on the ticket booth rates for 3 adults and 1 child. Come with 4 people (minimum 1 child) during the Easter Holidays and get up to €18 discount. Let the day of your visit define the ticket price ! Order 6 tickets or more a day in advance and get up to €8 discount per ticket ! - Undated ticket, for one day at your convenience until 6/10/2019. 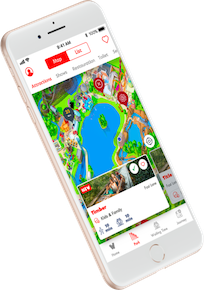 Visit the park on a day of your choice until 6/10/2019 !